Four main burners provide an outstanding burner to grilling surface ratio, which means better, more even heating, meeting all of your barbecueing needs. Feed a crowd, grilling up to 24 hamburgers at once. Sear steaks, roast holiday meals, bake desserts and breads, smoke, and even rotisserie meals using Napoleon's LEX485RSIB-1 Gas Grill. A double walled lid holds heat in for oven-like performance. The ceramic infrared burners provide incredible heat for the perfect crust and juiciest meat when using the infrared side burner or rear rotisserie burner. Napoleon's JETFIRE™ ignition system means fast and easy lighting every time. 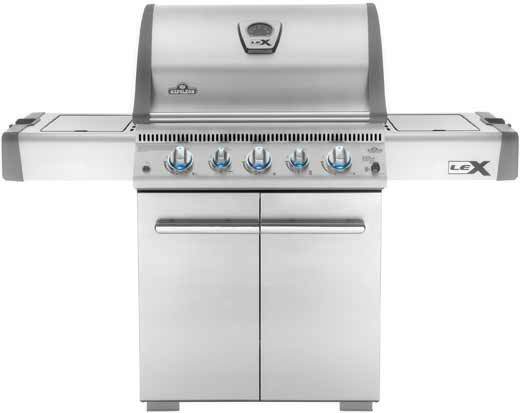 The LEX485RSIB-1 has everything needed for a fantastic grilling experience.